Technology is gradually redefining how we see life. Mobile app developers are combating each other to emerge as the pioneers in rendering applications that can give a futuristic experience with their mobile device. Internet of things is one such progeny of modern technology that is directing the developers to strategize according to the rising demands for hi-tech gadgets and automation to suffice the grueling hunger for futuristic technology. Mobile technology was the first step taken by humanity towards modernity, paving the way for technology to explore and create. Already there are examples of smart homes with connecting gadgets devised on Machine Learning and Artificial Intelligence, along with smart vehicles as well. We have also come across applications that control the gadgets even from a distance. Mobile application development companies such as iOS app developers and tech giants such as Apple are investing more in smart vehicles and smart home gadgets since the app world is gradually getting saturated. Internet of things or IoT, as we all know, is the interconnection established between everyday devices with that of the internet that triggers the exchange of data amongst them. The transportation sector is yet to integrate the modern technology with full force but the automobile sub-sector is first to adopt Internet of things and we have few examples of driverless, connected smart cars designed by top companies. Smart connected and driverless cars- Such examples of smart vehicles connected with smartphone applications to exchange millions of actionable data while commuting to render a futuristic driving experience to the users. They stress more on rider safety by cutting out accidental possibilities, minimizing the journey time topping up with a range of entertainment options for the riders. Moreover, the vehicles are automated navigating to GPS enabled information, accessing the most economical route as per their wiring to eliminate human errors in traffic altogether. 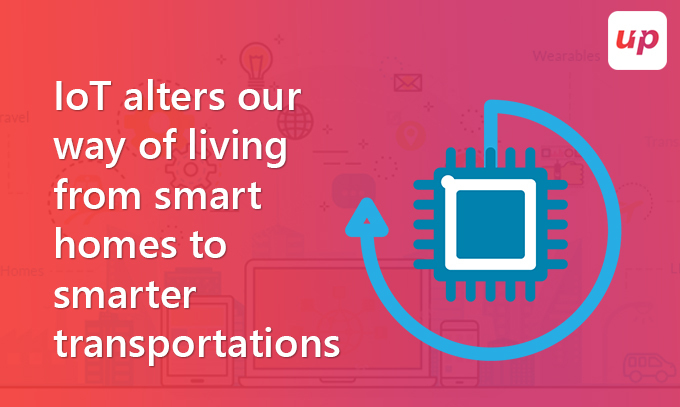 Smart data hubs- Smart transportation can also be considered as Smart data hubs designed with the sole purpose of ensuring rider safety with IoT’s predictive analysis and timely alerts to make the entire journey safer and enjoyable. More so the sensors allocated to the devices are intelligent enough to identify and timely feed information on inaccessible elements of the carrier to cut down sudden breakdowns. Smart road systems- Road management and maintenance is also evolving and harnessing the Internet of things technology to plan out cities integrated with systems that will feed crucial data to urban planners making it a smart infrastructure investment. Smart navigation tools- The smart vehicles need to depend on Google Map applications or paper maps to seek out the route to places. Interconnected navigation systems cater to mobilize the vehicles with preinstalled instructions pertaining to locating our desired destinations. Deviation from ownership to users- Heavy traffic is a curse of modern living that, in turn, cumulates the Green House effect on the environment. Internet of things emerges as a boon to finding the apt solution to this issue and opening a new venue for mobile developers to explore. With the rise OLA and Uber sharing, the world is moving towards redefining the whole concept of cars from ownership to users. Each rider can enjoy the benefits of traveling in a car but sharing with others within agreed terms and times. Hence we have fewer cars in traffic yet maximizing the per-ride usage. Cut down a search for parking space- The best mobile application developers have designed car parking applications to pre-book a car park area even before physically reaching the spot to cut down the time taken to seek out free parking space. We are yet to witness the more usage of such an application in future. A step towards green revolution- Car emissions is one of the dominant contributors to a Greenhouse effect. Internet of things is out to provide an alternate yet the efficient system to cut down the overall emission from a single trip through shared rides and electric generated vehicles. The rising concern for Global warming is pushing the nations to research for alternates that cuts down greenhouse gas emissions and Green Revolution is a step towards popularizing such a movement. Modern thinking imbibed into artificially intelligent household gadgets and cars are pushing the world towards an era of automation replacing human intervention completely. The mobile app development companies need to find out other options to make money since the application and smartphone market, as earlier mentioned, is reaching the point of saturation. The demand is now for smart home appliances, transportation, and automation as displayed by the Internet of things. Fluper, one of the top-rated mobile app development company, has always incentivized innovation and innovation with a touch of individual creativity molded with modern technology gives rise to an incredible creation, something that its team is well-equipped with, exemplifying in their developed applications.